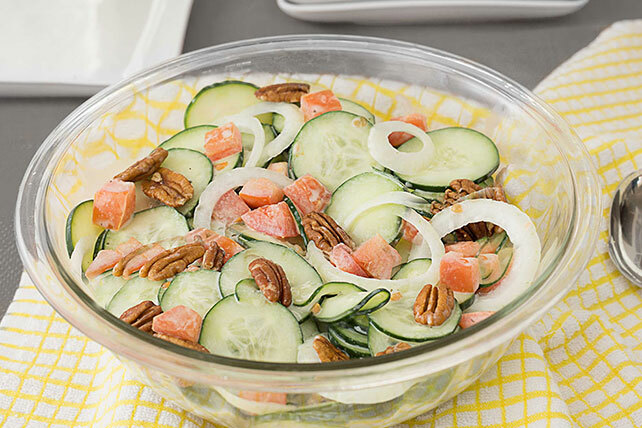 Complement almost any dish with our Creamy Cucumber Salad that includes veggies tossed with lite ranch dressing and topped with toasted pecans. Toss cucumbers, tomatoes and onion with dressing. Sprinkle with pecans just before serving. Toast Nuts: Spread nuts in a single layer in a baking pan. Bake at 350°F for 8 to 10 minutes, stirring occasionally.